Naga nationalism is an ideology that supports self-determination by the Naga people of India and Burma and the furtherance of Naga culture. Some Naga groups share a common belief of their ethnogenesis as a distinct people: these groups include Angami, Sema, Rengma, Lotha, Zeme, Liangmei and Rongmei. 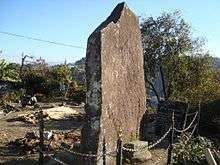 According to this belief, the ancestors of the Nagas lived in harmony together at a place called Mahkel (identified with the present-day Mao village of Makhel in Manipur, and, alternatively, believed to be near the Chindwin river in present-day Myanmar). As their population grew, they decided to split and spread outside Makhel. According to the Heraka faith, the Naga peoples took an oath pledging that they would come together again and live as a kingdom. However, when the British arrived in India, the various Naga tribes had no common national identity. The term "Naga" was a vaguely-defined exonym, which referred to the different isolated tribes in present-day Nagaland and its surrounding area. The different tribes spoke mutually unintelligible languages and had distinct cultures. Each Naga village was a sovereign state ruled by tribal elders. Internecine feuds, wars and headhunting campaigns were common among the Naga tribes. The British captured several Naga territories and consolidated them under the Naga Hills District of Assam. During the British rule, missionaries such as Miles Bronson and Edwin W. Clark introduced Christianity to the area, greatly changing the social and political fabric of the local society. The common Christian identity led to peace and unity among the various Naga tribes. Nagamese developed as a common language for inter-tribe communication. During the Kuki revolt (1917–19) and the World War I (1914–18), the British Government recruited a number of labourers and porters from the Naga tribes. As part of the labour corps, around 2000 Nagas were sent to France, where, alienated from the other British Indian troops, they developed a sense of unity. They agreed that after returning to their homeland, they will work towards unity and friendship among the various Naga tribes. These Nagas, together with the British officials, formed the Naga Club in 1918. This club provided the socio-political foundation for the Naga nationalist movement. In 1929, the Club submitted a memorandum to the Simon Commission, requesting that the Nagas should be given a choice of self-determination after the British departure from India. Heraka was a religious movement led by Haipou Jadonang and his successor Rani Gaidinliu, who sought to establish the legendary kingdom of the Naga people during 1929-33. The two aimed at creating a feeling of religious nationalism among the Nagas, mainly the Zeliangrong tribes (Zeme, Liangmei and Rongmei including Inpui-Kabui). They launched an independence struggle against the British, and sought to establish inter-tribal solidarity and unity. However, the movement was not widespread outside of the three Zeliangrong tribes due to its antagonistic attitude towards Christian converts and the Kukis. The movement also developed into a political uprising against the British, which prompted the Government to clamp down on it. In 1945, C. R. Pawsey, the deputy commissioner of the Naga Hills District, established the Naga Hills District Tribal Council as a forum of the various Naga groups. This body replaced the Naga Club, and a year later, developed into a political organization called the Naga National Council (NNC). The NNC initially demanded autonomy within the Indian Union and a separate electorate. However, later, under the leadership of Angami Zapu Phizo, it adopted a secessionist outlook and campaigned for the creation for a sovereign Naga state. The NNC declined as differences developed between Phizo and other leaders, and Phizo got the NNC secretary T. Sakhrie murdered in January 1956. After a series of armed conflicts and peace missions, the Government of India agreed to create the Naga Hills Tuensang Area (NHTA), a Union territory with a large degree of autonomy. After further protests, violence and diplomatic discussions, the Government recognised Nagaland as a full-fledged State within the Union of India. Since then, the Naga nationalism has co-existed with Indian nationalism. Nagaland recorded more than 87% voter turnout in 2014 Indian general election which was highest voters turnout in India which Indian authorities consider as faith of Naga people in democracy of India. ↑ Laishram, Bidhan (2004-12-04). "Naga Nationalism: The Inward Turn Of A Conflict". Institute of Peace & Conflict Studies. Manipur Online. Retrieved 2013-05-06. 1 2 3 4 Arkotong Longkumer (4 May 2010). Reform, Identity and Narratives of Belonging: The Heraka Movement in Northeast India. Continuum International Publishing Group. pp. 2–3. ISBN 978-0-8264-3970-3. Retrieved 5 June 2013. ↑ U. A. Shimray (2007). Naga Population and Integration Movement: Documentation. Mittal Publications. pp. 24–. ISBN 978-81-8324-181-6. Retrieved 5 June 2013. ↑ Bendangjungshi (2011). Confessing Christ in the Naga Context: Towards a Liberating Ecclesiology. LIT Verlag Münster. pp. 29–. ISBN 978-3-643-90071-5. Retrieved 5 June 2013. ↑ Chandrika Singh (2004). Naga Politics: A Critical Account. Mittal Publications. pp. 6–. ISBN 978-81-7099-920-1. Retrieved 5 June 2013. 1 2 3 Neivetso Venuh; Bonita Aleaz (2005). British Colonization and Restructuring of Naga Polity. Mittal Publications. pp. 55–65. ISBN 978-81-7099-978-2. Retrieved 5 June 2013. ↑ Chaube, Shibani Kinkar (1999) . Hill politics in Northeast India. Orient Longman. pp. 74–77. ISBN 81-250-1695-3. OCLC 42913576. ↑ Chaube, Shibani Kinkar (1999) . Hill politics in Northeast India. Orient Longman. pp. 153–161. ISBN 81-250-1695-3. OCLC 42913576. ↑ "State-Wise Voter Turnout in General Election 2014". Election Commission of India. Government of India. Press Information Bureau. 21 May 2014. Retrieved 7 April 2015. ↑ "Nagaland tops in Lok Sabha voter turnout". The Times of India. 22 May 2014. Retrieved 10 April 2015.